Moving on with our petals! Petals have 3 parts to earn, if you didn't know that already. Our flower friend this time is Gerri the Geranium. 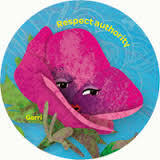 Gerri helps the girls learn to Respect Authority. I love that the story focuses on the "non-traditional" types of authority that most of us would think of... This is a good one and one that I know a lot of adults that could use a refresher... but I digress. Gerri's story is in the book. If you want to take a short cut, you can show the video a troop put together. Following the lead of the story, I chose to have one of my Daisy Mom's lead this discussion. 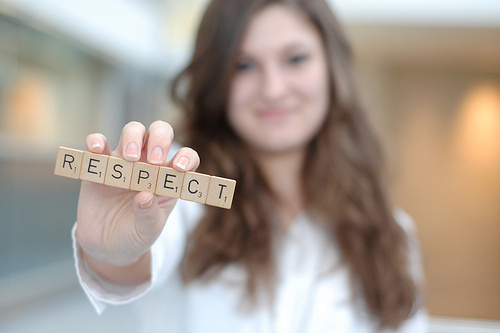 She is a Middle School Math teacher and sports coach, so I asked her to talk about the classroom rules she asks her students to follow and why it's important for students to respect teachers. Make sure you build in time for questions and contrast. Remember to explain to the girls that each classroom is different and it's important to know what your teacher expects. In order to tie in our story, guest speaker, and showing respect, the girls made Brown Sugar Hand Scrub to give as a thank you gift for their teachers. I found cheap little food storage containers at the Dollar Tree and it's Valentine's time, so they had little bags the containers fit in perfectly. I chose NOT to use glass, because 1st graders are taking these to school and I would hate for them to drop and break and have shattered glass to deal with. YIKES! I thought the bag would be a good idea, because then they aren't just carrying a container... presentation is everything. In addition to the scrub, I had the girls draw a picture or color a picture for their teacher. I use the Respect Authority coloring sheet from MakingFriends, because it was perfect and gave their teachers insight about how awesome Girl Scouts can be for their students. 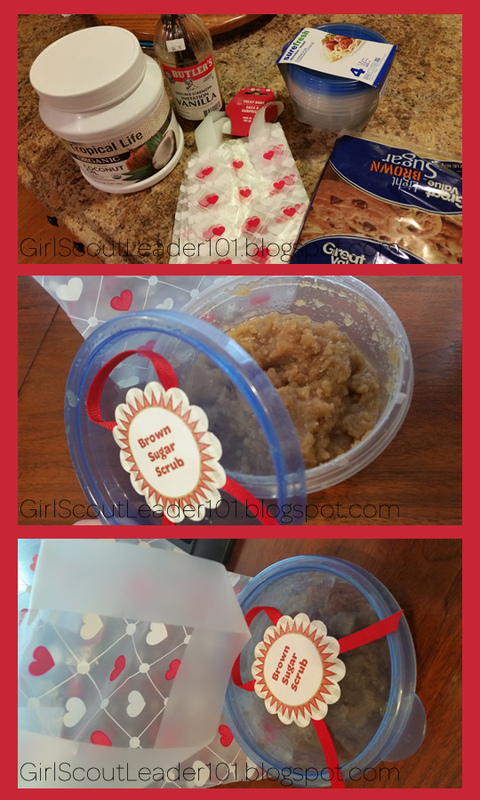 Here is the recipe I used for the scrub and some labels I made for the top of the containers. Stir it together really well and store in an airtight container. If you have the girls wash and DRY their hands, they could use their hands to mix it. I had the girls stir it up in the containers we were giving, because then everyone was responsible for their own. I did help on the measuring part. Since we used plastic containers, no concern of putting it right in the shower. 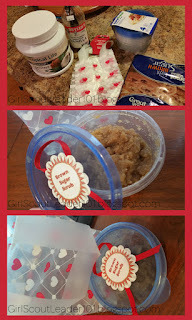 To finish off our container, we used a cute label and piece of ribbon. Simple, yet perfect. recipe card from me along with a note of thanks, in case they want to make more. of course, you could add some candy or chapstick or drink mixes or gift cards for Starbucks.... but, I was trying to keep this relatively cheap.